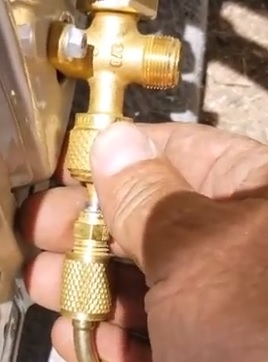 Doing a DIY Mini Split install is a great way to save money for the DIY handy person. Even though you can save on labor-cost the mini split unit and tools will need to be bought. The good news is for small mini split jobs expensive HVAC equipment is not required with many budget tools working well. After installing many Mini Split systems here is the budget tool I use. At the bottom of the page I have made videos showing how to install a mini split along with the tools I use. A HVAC manifold gauge set will be needed to help pump down the unit into a vacuum. Gauges are easy to hook up and use with many available both high-end and budget. A low-cost set is all that is needed for doing basic repairs and installs. One budget set I have used and works well is the ZENY A/C Manifold Gauge Set. 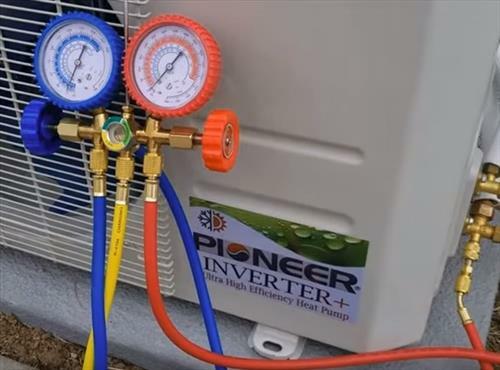 It is not high-end but is a good for the part time HVAC tech or DIY Mini Split installs. 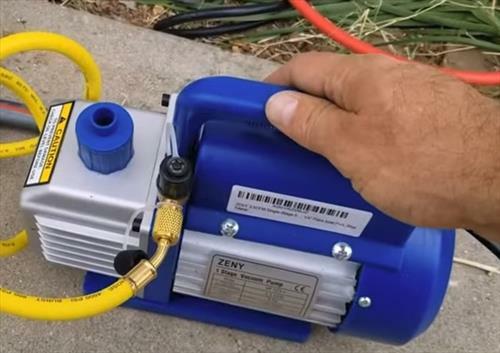 A HVAC Vacuum Pump will also be needed which there is also many units available. If you are only going to use it occasional or for a few Mini Split installs nothing expensive is needed. I again bought a low-cost Zeny unit which has been working well several installs later. The Zeny Gauges and Vacuum Pump come separate or in a package deal which is cheaper. Check your set to be sure also sometimes it is included with top-end gauges. The adapter is a low-cost item but will be needed to hook up to the low pressure side and pump the unit into a vacuum. The copper line-set that runs between the inside and outside units usually have a preset length of 16 feet. Be sure to check the unit that is bought for how long the line-set is but 16 feet is very common. Most all DIY kits will have the ends already flared so a flare tool is not needed unless the line-set is cut. If the distance between the the inside and outside unit is short it is a good idea to also shorten the line-set. Keep in mind this is not necessary for the mini split to work with many people simply leaving the extra length rolled up in a loop. While it can be left rolled up for a professional install it should be shortened which requires cutting the line and flaring the ends. If you are novice installer I would not cut the line-set if it is too long and leave the excess rolled up in a loop. While many will argue it needs to be cut I have seen 10-15 year old installs done this way still working good. A cordless drill will make the job much easier for the various screws and holes that need to be done. The wall plate for the inside unit will need to be screwed into place and solid on studs. Also a 3 inch hole will need to be drilled through the wall for the line-set and control wires. There are many low-cost cordless drills which I would recommend getting a 18 volt drill. A lower voltage drill will likely also work but has much less power. I also use my cordless on may other projects so a 18 volt drill it is simply a personal preference. I bought a budget Ryobi unit seom years ago and after a lot of projects it is still going strong. The one downside with any cordless is not usually the drill but the batteries which go bad before the drill. A hole will need to be drilled though a wall for the line-set and control wires to go between the inside and outside condensers. The hole is usually 3 inches be sure to check the mini split bought for the right size needed. Hole saws are low-cost items. 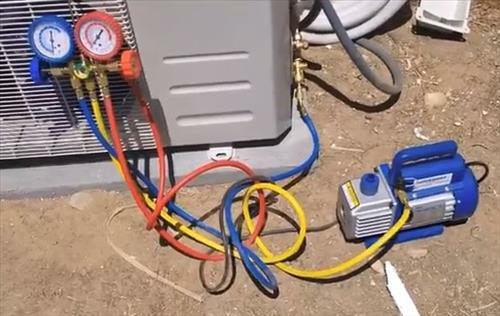 An Allen wrench will be needed to open up the refrigerant lines and let it into the system. The size can vary depending on the manufacture so it would be best to buy a whole set. A set is a cheap low-cost item. Some basic everyday tools will be needed such as screw drivers and pliers. The line-set bolts will need to be tightened together which require wenches. Wire-cutters are also needed for splicing the electric. These basic tools should be in most any tool box. The above is the tools that will be needed to do a mini split install. Of course check with the DIY Kit to see if any special tools are required. Most DIY people will have many of the tools above and will only need to buy one or two more. 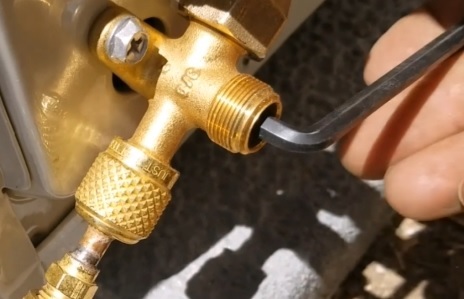 Installing a mini split is not that difficult especially with the right tools for the job. A torque wrench could be used is you are unsure how tight they should get. Most HVAC techs don’t use one but it couldn’t hurt. If you do use one be sure to get a good brand to get the right readings such as Yellow Jack Torque Kit which is a good unit.